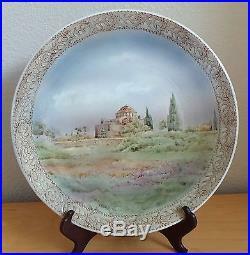 A beautiful hand painted ceramic wall plaque or plate signed by the Greek artist M. It depicts Daphni Monastery - one of the great masterpieces of the Byzantine Empire, especially famed for its beautiful interior mosaics. Founded on the site of a Greek temple, it is now a museum and World Heritage Site. The artist depicts the Monastery as it was in 1953 prior to close for restoration work in 1999. The painting is superb - as you move further away the picture is more realistic. 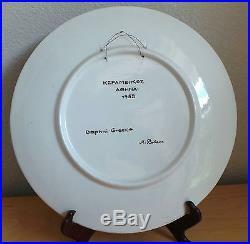 The back signed: KEPAMEIKOE AONNAI 1853 Daphni-Greece M. It has a wire at the back. The plaque is 11 3/4 inches in diameter. It is in excellent with no problem to report condition. 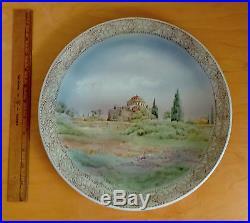 The item "Vintage Hand Painted Wall Plaque Daphni Monastery Greece by A. 1953" is in sale since Monday, September 14, 2015. This item is in the category "Collectibles\Cultures & Ethnicities\European". The seller is "llpass" and is located in North Port, Florida.